The elements of Craftsman styling of industrial design and natural wood tones are blended to achieve the unique look of the Santos Collection. The Craftsman design is enhanced by distressing its solid rubberwood construction, which is covered in a natural brown finish highlighting the wood grain texture finish. Open media storage and drawer storage enhance the function of the 47- inch, 58-inch, and 68-inch entertainment consoles. Staple accenting on the table’s edge hints at a rough-hewn industrial look that has been softened for your living room. 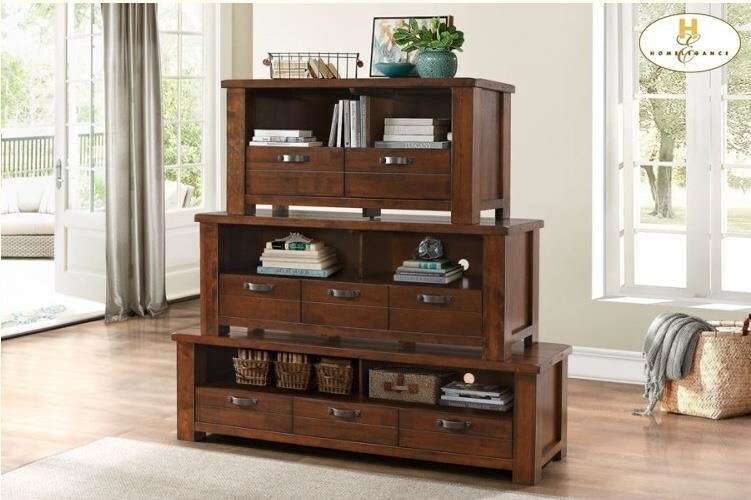 The Santos 58" TV Stand by Homelegance from Boulevard Home Furnishings. We proudly serve the St. George, Cedar City, Hurricane, Utah, Mesquite, Nevada area. Product availability may vary. Contact us for the most current availability on this product. The Santos collection is a great option if you are looking for Casual furniture in the St. George, Cedar City, Hurricane, Utah, Mesquite, Nevada area.